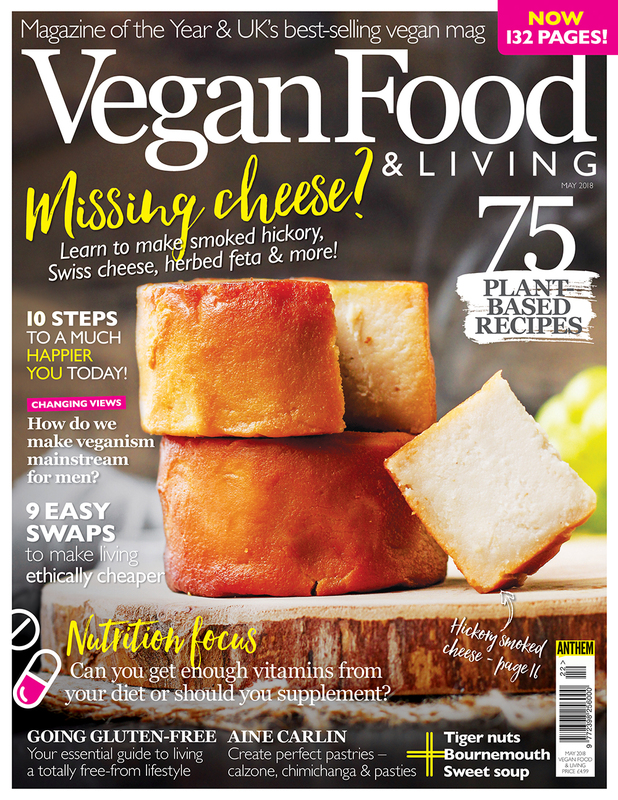 Get your vegan cheese fix with the May issue of Vegan Food & Living! Are you missing cheese yet apprehensive to try the new varieties coming onto the market? In the May issue of Vegan Food & Living, not only do we put vegan cheese to the test for you so you can find out how to buy the best, but we also have some delicious recipes for making your own cheese from home. With recipes from smoked hickory to Swiss cheese and herbed feta, you’ll miss cheese no more! Also this issue we take a look at how to make veganism attract more men, share 9 easy swaps to make living ethically cheaper and Aine Carlin joins us to whip up some tasty pastry treats from calzone to chimichanga and pasties. Plus we reveal whether you can get enough vitamins from your diet or if you should be taking supplements, and give you an essential guide to going gluten-free.